According to a declassified government audit of the Iraqi Train and Equip Fund obtained by Amnesty International through a Freedom of Information Act (FOIA) request, hundreds of Humvees and mortars, as well as tens of thousands of rifles, remain unaccounted for due to a lack of central database for keeping track of U.S. taxpayer-funded military equipment. “This audit provides a worrying insight into the US Army’s flawed – and potentially dangerous – system for controlling millions of dollars’ worth of arms transfers to a hugely volatile region,” declared Patrick Wilcken, the arms control and human rights researcher for Amnesty, in a statement. The U.S. Army provided the unaccounted weapons and other military equipment to the U.S.-backed Iraqi Army, Kurdish Peshmerga troops, and the Iran-allied Popular Mobilization Units (PMU), a predominantly group of Shiite fighters sanctioned by Baghdad. Amnesty International has accused PMU fighters, also known as the Popular Mobilization Forces (PMF) and al-Hashd al-Shabi, of committing atrocities against civilians in Iraq using weapons from the United States and other countries. The report, which covered September of last year, noted that the Pentagon fails to track the weapons after being transferred to the Baghdad-based government. U.S. Department of Defense officials “did not have accurate, up-to-date records on the quantity and location” of a vast amount of equipment pouring into Iraq and Kuwait to provision the Iraqi Army, reveals Amnesty International in a press release. “The equipment – which include[s] hundreds of Humvee armored vehicles, tens of thousands of assault rifles and hundreds of mortar rounds – was destined for use by the central Iraqi Army, including the predominantly [Shiite] Popular Mobilization Units, as well as the Kurdish Peshmerga forces,” it adds. In the report, auditors reveal several lapses in the manner in which U.S. taxpayer-funded military equipment is logged and monitored beginning from the point of delivery. Fragmentary record-keeping in arms depots in Kuwait and Iraq, with information logged across multiple spreadsheets, databases and even on hand-written receipts. In fiscal year 2015 alone, which includes the time covered by the government audit, the U.S. Congress allocated $1.6 billion for the fight against ISIS. Meanwhile, a previous Department of Defense audit in 2015 pointed to the fact that the Iraqi armed forces applied even laxer stockpile monitoring procedures. In some cases, the Iraqi Army was unaware of what was stored in its own warehouses, while other military equipment – unopened and uninventoried – was stored out in the open in shipping containers. “Sending millions of dollars’ worth of arms into a black hole and hoping for the best is not a viable counter-terrorism strategy; it is just reckless,” said Wilcken. 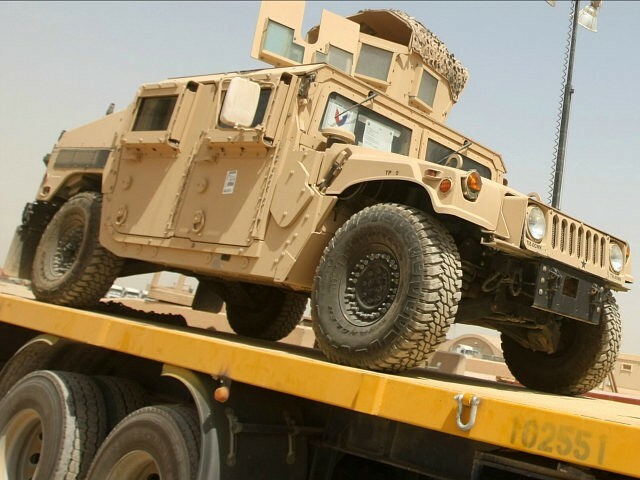 Amnesty acknowledges that the U.S. military has vowed to improve its systems for tracking and monitoring future military equipment transfers to Iraq. “However, the Department of Defense made almost identical commitments in response to a report for Congress as long ago as 2007 that raised similar concerns,” it points out.